A fa építő makett alapanyagai többnyire hűek az eredeti hajó anyagaihoz. A makett elemei ragasztással, szögeléssel kerülnek összeállításra. A very attractive and colourful subject, this small merchant vessel is employed around the Adriatic Sea. 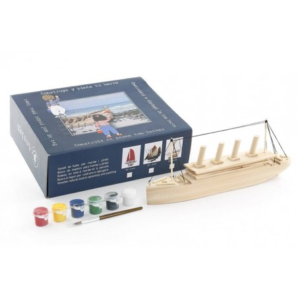 The kit contains keel, frames and deck in pre-cut wood, fittings in both wood and metal, sail cloth, instructions and plans. Easy to build, Junior Line. These kits make it possible for all modellers to easily build perfectly scaled ships with quality materials.